Picked up new Priv on release day from Verizon store. 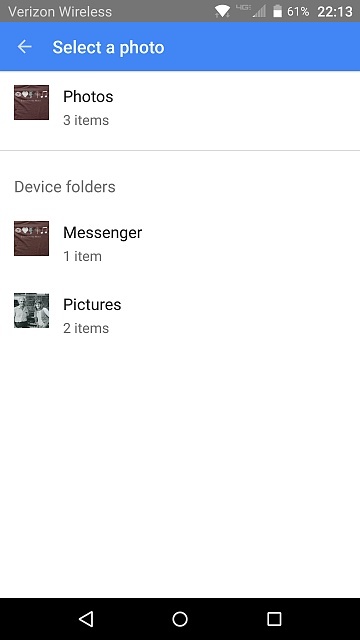 When I went into Hangouts to send a picture, the only pics showing in the selection dialog are the two test pics I took with the camera and one I downloaded to the phone. So I uninstalled Hangouts and installed Messenger and same problem occurs. The same dialog works fine with Gmail. Examples below. Note the picture count difference. Any help is appreciated. Where are you storing the photos? 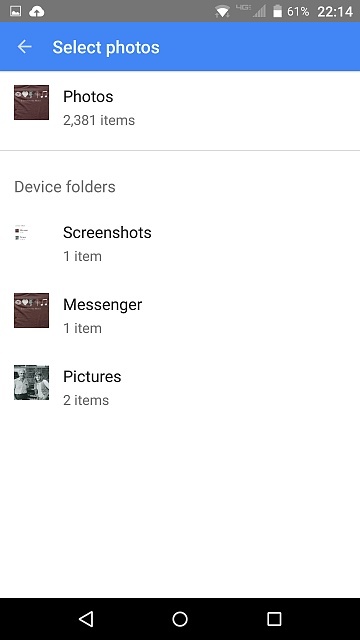 I don't use those apps but I had trouble in some picture/photo apps finding photos I had copied to a Photo Folder and "album" subfolders on my sd-card. When I moved that entire Photo folder (and subs) to the DCIM folder on the sd-card they showed up in all the photo apps I have been trying. well that would be one fix but it shouldnt have to be stored locally. the lower dialog is from gmail and works fine. not getting much response on this. may have to try hard reset. thankyou for your time. Hard reset and reloaded apps, adjusted settings and permissions to no avail. Checked forums for 6 days at BB, VZW, here and reddit r/blackberry coming up empty. Called BB and VZW customer service. Phone's going back for exchange. Still within 14 days. Hope they don't charge me the store discretionary restocking fee. I'm already going to eat the $25 screen protector. Thanks for your input. Its so frustrating that I can select it in Photos to send via any MMS app but MUST download to phone before sending. Texting pics from Google Photos is a deal breaker I'm afraid and I want to keep this phone and support Blackberry for their corporate mission. If this problem occurs with next Priv, it will be returned and I'll revert back to my Motorola Droid Turbo that worked great. Peace. From what I remember, it has to do with the fact that the Priv doesn't come with a default gallery app, you'll have to download one. Google Photos doesn't count as a gallery, apparently. It's working fine for me, have you updated all your apps? Which gallery app did you use to get it working? I ended up installing a good xd card and DL all my archived pics from Photos to it. Its messy but works now. yup all UTD... no luck so did above to sorta fix it. strange and annoying. Why are my emails suddenly deleting from my phone and not computer?